Greg Connell (BScEE 2012), and his four partners who started the business Groupnotes, were the winners of the 2012 Global Startup Battle - an international competition with more than 1,000 teams from 60 different countries across the globe. The international contest is all about launching a startup in just 54 hours. It's made up of teams who have won the startup competition in their home city. 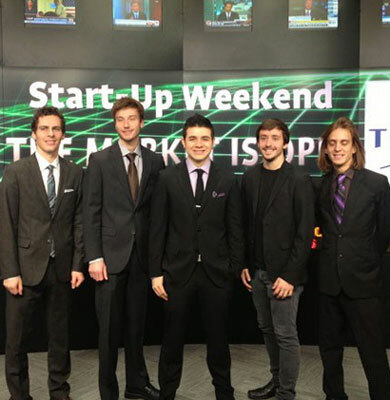 Merely 24 hours after the Groupnotes team took top prize at the Toronto Startup Weekend in November, they had to hand in their video presentation to the international competition. Their business, Groupnotes, is an education software tool that allows school groups to leave notes for each other on webpages. It took top prize - the first Canadian group to ever win - to earn the team a prize package worth more than $50,000. The team will be headed to San Francisco to tour Googleplex and meet with investors, founders, and mentors and in March, they will be flying to Rio de Janeiro to participate in the annual Global Entrepreneurship Congress. Greg Connell also received the Technology Management and Entrepreneurship Diploma while at UNB and is currently pursuing his Master's in Engineering Entrepreneurship and Innovation at McMaster University. He's one of many examples of how UNB grads are carrying forward with an entrepreneurial spirit. Congratulations to Greg and his team!